4.11 When asked what causes electrolyte solutions to conduct electricity, a student responds that it is due to the movement of electrons through the solution. Is the student correct? If not, what is the correct response? 4.12 When methanol, CH3OH, is dissolved in water, a nonconducting solution results. When acetic acid, CH3COOH, dissolves in water, the solution is weakly conducting and acidic in nature. Describe what happens upon dissolution in the two cases, and account for the different results. 4.13 We have learned in this chapter that many ionic solids dissolve in water as strong electrolytes, that is, as separated ions in solution. What properties of water facilitate this process? Would you expect ionic compounds to be soluble in elemental liquids like bromine or mercury, just as they are in water? Explain. 4.14 What does it mean to say that ions are solvated when an ionic substance dissolves in water? 4.15 Specify what ions are present in solution upon dissolving each of the following substances in water: (a) ZnCl2, (b) HNO3, (c) (NH4)2SO4, (d) Ca(OH)2. 4.16 Specify what ions are present upon dissolving each of the following substances in water: (a) MgI2, (b) Al(NO3)3, (c) HClO4, (d) NaCH3COO. 4.17 Formic acid, HCOOH, is a weak electrolyte. What solute particles are present in an aqueous solution of this compound? Write the chemical equation for the ionization of HCOOH. 4.18 Acetone, CH3COCH3, is a nonelectrolyte; hypochlorous acid, HClO, is a weak electrolyte; and ammonium chloride, NH4Cl, is a strong electrolyte. (a) What are the solute particles present in aqueous solutions of each compound? (b) If 0.1 mol of each compound is dissolved in solution, which one contains 0.2 mol of solute particles, which contains 0.1 mol of solute particles, and which contains somewhere between 0.1 and 0.2 mol of solute particles? 4.19 Using solubility guidelines, predict whether each of the fol lowing compounds is soluble or insoluble in water: (a) MgBr2, (b) PbI2, (c) (NH4)2CO3, (d) Sr(OH)2, (e) ZnSO4. 4.20 Predict whether each of the following compounds is soluble in water: (a) AgI, (b) Na2CO3, (c) BaCl2, (d) Al(OH)3, (e) Zn(CH3COO)2. 4.21 Will precipitation occur when the following solutions are mixed? If so, write a balanced chemical equation for the reaction. (a) Na2CO3 and AgNO3, (b) NaNO3 and NiSO4, (c) FeSO4 and Pb(NO3)2. 4.22 Identify the precipitate (if any) that forms when the following solutions are mixed, and write a balanced equation for each reaction. (a) NaCH3COO and HCl, (b) KOH and Cu(NO3)2, (c) Na2S and CdSO4. 4.23 Name the spectator ions in any reactions that may be involved when each of the following pairs of solutions are mixed. 4.24 Write balanced net ionic equations for the reactions that occur in each of the following cases. Identify the spectator ion or ions in each reaction. 4.25 Separate samples of a solution of an unknown salt are treated with dilute solutions of HBr, H2SO4, and NaOH. A precipitate forms in all three cases. Which of the following cations could the solution contain: K+, Pb2+, Ba2+? 4.26 Separate samples of a solution of an unknown ionic compound are treated with dilute AgNO3, Pb(NO3)2, and BaCl2. Precipitates form in all three cases. Which of the following could be the anion of the unknown salt: Br−, CO32−, NO3−? 4.27 You know that an unlabeled bottle contains a solution of one of the following: AgNO3, CaCl2, or Al2(SO4)3. A friend suggests that you test a portion of the solution with Ba(NO3)2 and then with NaCl solutions. Explain how these two tests together would be sufficient to determine which salt is present in the solution. 4.28 Three solutions are mixed together to form a single solution. One contains 0.2 mol Pb(CH3COO)2, the second contains 0.1 mol Na2S, and the third contains 0.1 mol CaCl2. (a) Write the net ionic equations for the precipitation reaction or reactions that occur. (b) What are the spectator ions in the solution? 4.30 Which of the following solutions is the most basic? (a) 0.6 M NH3, (b) 0.150 M KOH, (c) 0.100 M Ba(OH)2. Explain. 4.31 What is the difference between (a) a monoprotic acid and a diprotic acid, (b) a weak acid and a strong acid, (c) an acid and a base? 4.32 Explain the following observations: (a) NH3 contains no OH−ions, and yet its aqueous solutions are basic; (b) HF is called a weak acid, and yet it is very reactive; (c) although sulfuric acid is a strong electrolyte, an aqueous solution of H2SO4 contains more HSO4− ions than SO42−ions. 4.33 Is there any correlation between the anions that form when each of the strong acids in Table 4.2 dissociates and the anions that normally form soluble ionic compounds (Table 4.1)? Which anions if any are exceptions to the general trend? 4.34 What is the relationship between the solubility rules in Table 4.1 and the list of strong bases in Table 4.2? Another way of asking this question is, why is Cd(OH)2, for example, not listed as a strong base in Table 4.2? 4.35 Label each of the following substances as an acid, base, salt, or none of the above. Indicate whether the substance exists in aqueous solution entirely in molecular form, entirely as ions, or as a mixture of molecules and ions. (a) HF, (b) acetonitrile, CH3CN, (c) NaClO4, (d)Ba(OH)2. 4.36 An aqueous solution of an unknown solute is tested with litmus paper and found to be acidic. The solution is weakly conducting compared with a solution of NaCl of the same concentration. Which of the following substances could the unknown be: KOH, NH3, HNO3, KClO2, H3PO3, CH3COCH3 (acetone)? 4.37 Classify each of the following substances as a nonelectrolyte, weak electrolyte, or strong electrolyte in water: (a) H2SO3, (b) C2H5OH (ethanol), (c) NH3, (d) KClO3, (e) Cu(NO3)2. 4.38 Classify each of the following aqueous solutions as a nonelectrolyte, weak electrolyte, or strong electrolyte: (a) LiClO4, (b) HClO, (c) CH3CH2CH2OH (propanol), (d) HClO3, (e) CuSO4, (f) C12H22O11 (sucrose). 4.41 Write balanced molecular and net ionic equations for the following reactions, and identify the gas formed in each: (a) solid cadmium sulfide reacts with an aqueous solution of sulfuric acid; (b) solid magnesium carbonate reacts with an aqueous solution of perchloric acid. (b) Based on the equation in part (a), write the net ionic equation for the reaction that occurs between NiO(s) and an aqueous solution of nitric acid. 4.43 Magnesium carbonate, magnesium oxide, and magnesium hydroxide are all white solids that react with acidic solutions. (a) Write a balanced molecular equation and a net ionic equation for the reaction that occurs when each substance reacts with a hydrochloric acid solution. (b)By observing the reactions in part (a) could you distinguish any of the three magnesium substances from the other two? If so how? (c) If excess HCl(aq) is added, would the clear solutions left behind after the reaction is complete contain the same or different ions in each case? 4.44 As K2O dissolves in water, the oxide ion reacts with water molecules to form hydroxide ions. Write the molecular and net ionic equations for this reaction. Based on the definitions of acid and base, what ion is the base in this reaction? What is the acid? What is the spectator ion in the reaction? 4.45 Define oxidation and reduction in terms of (a) electron transfer and (b) oxidation numbers. 4.46 Can oxidation occur without oxygen? Can oxidation occur without reduction? 4.47 Which region of the periodic table shown here contains the most readily oxidized elements? Which region contains the least readily oxidized? 4.48 Determine the oxidation number of sulfur in each of the following substances: (a) barium sulfate, BaSO4, (b) sulfurous acid, H2SO3, (c) strontium sulfide, SrS, (d) hydrogen sulfide, H2S. (e) Based on these compounds what is the range of oxidation numbers seen for sulfur? Is there any relationship between the range of accessible oxidation states and sulfur's position on the periodic table? 4.49 Determine the oxidation number for the indicated element in each of the following substances: (a) S in SO2, (b) C in COCl2, (c) Mn in KMnO4, (d) Br in HBrO, (e) As in As4, (f) O in K2O2. 4.50 Determine the oxidation number for the indicated element in each of the following compounds: (a) Co in LiCoO2, (b) Al in NaAlH4, (c) C in CH3OH (methanol), (d) N in GaN, (e) Cl in HClO2, (f) Cr in BaCrO4. 4.51 Which element is oxidized and which is reduced in the following reactions? 4.52 Which of the following are redox reactions? For those that are, indicate which element is oxidized and which is reduced. For those that are not, indicate whether they are precipitation or neutralization reactions. 4.53 Write balanced molecular and net ionic equations for the reactions of (a) manganese with dilute sulfuric acid, (b) chromium with hydrobromic acid, (c) tin with hydrochloric acid, (d) aluminum with formic acid, HCOOH. 4.54 Write balanced molecular and net ionic equations for the reactions of (a) hydrochloric acid with nickel, (b) dilute sulfuric acid with iron, (c) hydrobromic acid with magnesium, (d) acetic acid, CH3COOH, with zinc. 4.55 Using the activity series (Table 4.5), write balanced chemical equations for the following reactions. If no reaction occurs, simply write NR. (a) Iron metal is added to a solution of copper(II) nitrate; (b) zinc metal is added to a solution of magnesium sulfate; (c) hydrobromic acid is added to tin metal; (d) hydrogen gas is bubbled through an aqueous solution of nickel(II) chloride; (e) aluminum metal is added to a solution of cobalt(II) sulfate. 4.56 Using the activity series (Table 4.5), write balanced chemical equations for the following reactions. If no reaction occurs, simply write NR. 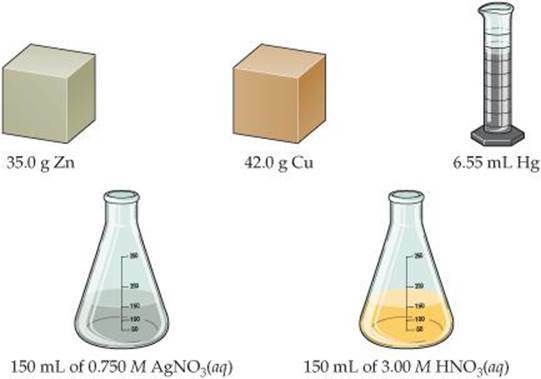 (a) Nickel metal is added to a solution of copper(II) nitrate; (b) a solution of zinc nitrate is added to a solution of magnesium sulfate; (c)hydrochloric acid is added to gold metal; (d) chromium metal is immersed in an aqueous solution of cobalt(II) chloride; (e) hydrogen gas is bubbled through a solution of silver nitrate. 4.57 The metal cadmium tends to form Cd2+ ions. The following observations are made: (i) When a strip of zinc metal is placed in CdCl2(aq), cadmium metal is deposited on the strip. (ii) When a strip of cadmium metal is placed in Ni(NO3)2(aq), nickel metal is deposited on the strip. (a) Write net ionic equations to explain each of the preceding observations. (b) What can you conclude about the position of cadmium in the activity series? (c) What experiments would you need to perform to locate more precisely the position of cadmium in the activity series? (b) Relate the positions of the halogens in the periodic table with their locations in this activity series. (c) Predict whether a reaction occurs when the following reagents are mixed: Cl2(aq) and KI(aq); Br2(aq) and LiCl(aq). 4.59 (a) Is the concentration of a solution an intensive or an extensive property? (b) What is the difference between 0.50 mol HCl and 0.50 M HCl? 4.60 (a) Suppose you prepare 500 mL of a 0.10 M solution of some salt and then spill some of it. What happens to the concentration of the solution left in the container? (b) Suppose you prepare 500 mL of a 0.10 M aqueous solution of some salt and let it sit out, uncovered, for a long time, and some water evaporates. What happens to the concentration of the solution left in the container? (c) A certain volume of a 0.50 M solution contains 4.5 g of a salt. What mass of the salt is present in the same volume of a 2.50 M solution? 4.61 (a) Calculate the molarity of a solution that contains 0.175 mol ZnCl2 in exactly 150 mL of solution. (b) How many moles of HCl are present in 35.0 mL of a 4.50 M solution of nitric acid? (c) How many milliliters of 6.00 M NaOH solution are needed to provide 0.325 mol of NaOH? 4.62 (a) Calculate the molarity of a solution made by dissolving 12.5 grams of Na2CrO4 in enough water to form exactly 550 mL of solution. (b) How many moles of KBr are present in 150 mL of a 0.275 M solution? (c) How many milliliters of 6.1 M HCl solution are needed to obtain 0.100 mol of HCl? 4.63 The average adult human male has a total blood volume of 5.0 L. If the concentration of sodium ion in this average individual is 0.135 M, what is the mass of sodium ion circulating in the blood? 4.64 A person suffering from hyponatremia has a sodium ion concentration in the blood of 0.118 M and a total blood volume of 4.6 L. What mass of sodium chloride would need to be added to the blood to bring the sodium ion concentration up to 0.138 M, assuming no change in blood volume? 4.65 The concentration of alcohol (CH3CH2OH) in blood, called the “blood alcohol concentration” or BAC, is given in units of grams of alcohol per 100 mL of blood. The legal definition of intoxication, in many states of the United States, is that the BAC is 0.08 or higher. What is the concentration of alcohol, in terms of molarity, in blood if the BAC is 0.08? 4.66 The average adult male has a total blood volume of 5.0 L. After drinking a few beers, he has a BAC of 0.10 (see Exercise 4.65). What mass of alcohol is circulating in his blood? 4.67 Calculate (a) the number of grams of solute in 0.250 L of 0.175 M KBr, (b) the molar concentration of a solution containing 14.75 g of Ca(NO3)2 in 1.375 L, (c) the volume of 1.50 M Na3PO4 in milliliters that contains 2.50 g of solute. 4.68 (a) How many grams of solute are present in 15.0 mL of 0.736 M K2Cr2O7? (b) If 14.00 g of (NH4)2SO4 is dissolved in enough water to form 250 mL of solution, what is the molarity of the solution? (c) How many milliliters of 0.0455 M CuSO4 contain 3.65 g of solute? 4.69 (a) Which will have the highest concentration of potassium ion: 0.20 M KCl, 0.15 M K2CrO4, or 0.080 M K3PO4? (b) Which will contain the greater number of moles of potassium ion: 30.0 mL of 0.15 M K2CrO4 or 25.0 mL of 0.080 M K3PO4? 4.70 In each of the following pairs, indicate which has the higher concentration of I− ion: (a) 0.10 M BaI2 or 0.25 M KI solution, (b) 100 mL of 0.10 M KI solution or 200 mL of 0.040 M ZnI2 solution, (c) 3.2 M HI solution or a solution made by dissolving 145 g of NaI in water to make 150 mL of solution. 4.71 Indicate the concentration of each ion or molecule present in the following solutions: (a) 0.25 M NaNO3, (b) 1.3 × 10−2M MgSO4, (c) 0.0150 M C6H12O6, (d) a mixture of 45.0 mL of 0.272 M NaCl and 65.0 mL of 0.0247 M (NH4)2CO3. Assume that the volumes are additive. 4.72 Indicate the concentration of each ion present in the solution formed by mixing (a) 42.0 mL of 0.170 M NaOH and 37.6 mL of 0.400 M NaOH, (b) 44.0 mL of 0.100 M and Na2SO4 and 25.0 mL of 0.150 M KCl, (c) 3.60 g KCl in 75.0 mL of 0.250 M CaCl2 solution. Assume that the volumes are additive. 4.73 (a) You have a stock solution of 14.8 M NH3. How many milliliters of this solution should you dilute to make 1000.0 mL of 0.250 M NH3? (b) If you take a 10.0-mL portion of the stock solution and dilute it to a total volume of 0.500 L, what will be the concentration of the final solution? 4.74 (a) How many milliliters of a stock solution of 6.0 M HNO3 would you have to use to prepare 110 mL of 0.500 M HNO3? (b) If you dilute 10.0 mL of the stock solution to a final volume of 0.250 L, what will be the concentration of the diluted solution? 4.75 (a) Starting with solid sucrose, C12H22O11, describe how you would prepare 250 mL of a 0.250 M sucrose solution. (b) Describe how you would prepare 350.0 mL of 0.100 M C12H22O11 starting with 3.00 L of 1.50 M C12H22O11. 4.76 (a) How would you prepare 175.0 mL of 0.150 M AgNO3 solution starting with pure AgNO3? (b) An experiment calls for you to use 100 mL of 0.50 M HNO3 solution. All you have available is a bottle of 3.6 M HNO3. How would you prepare the desired solution? 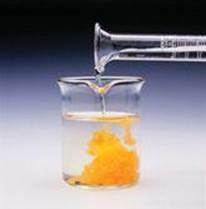 4.77 Pure acetic acid, known as glacial acetic acid, is a liquid with a density of 1.049 g/mL at 25 °C. Calculate the molarity of a solution of acetic acid made by dissolving 20.00 mL of glacial acetic acid at 25 °C in enough water to make 250.0 mL of solution. 4.78 Glycerol, C3H8O3, is a substance used extensively in the manufacture of cosmetics, foodstuffs, antifreeze, and plastics. Glycerol is a water-soluble liquid with a density of 1.2656 g/mL at 15 °C. Calculate the molarity of a solution of glycerol made by dissolving 50.000 mL glycerol at 15 °C in enough water to make 250.00 mL of solution. 4.79 What mass of KCl is needed to precipitate the silver ions from 15.0 mL of 0.200 M AgNO3 solution? 4.80 What mass of NaOH is needed to precipitate the Cd2+ ions from 35.0 mL of 0.500 M Cd(NO3)2 solution? 4.81 (a) What volume of 0.115 M HClO4 solution is needed to neutralize 50.00 mL of 0.0875 M NaOH? (b) What volume of 0.128 M HCl is needed to neutralize 2.87 g of Mg(OH)2? (c) If 25.8 mL of AgNO3 is needed to precipitate all the Cl− ions in a 785-mg sample of KCl (forming AgCl), what is the molarity of the AgNO3 solution? (d) If 45.3 mL of 0.108 M HCl solution is needed to neutralize a solution of KOH, how many grams of KOH must be present in the solution? 4.82 (a) How many milliliters of 0.120 M HCl are needed to completely neutralize 50.0 mL of 0.101 M Ba(OH)2 solution? (b) How many milliliters of 0.125 M H2SO4 are needed to neutralize 0.200 g of NaOH? (c) If 55.8 mL of BaCl2 solution is needed to precipitate all the sulfate ion in a 752-mg sample of Na2SO4, what is the molarity of the solution? (d) If 42.7 mL of 0.208 M HCl solution is needed to neutralize a solution of Ca(OH)2, how many grams of Ca(OH)2 must be in the solution? Sodium bicarbonate is added until the fizzing due to the formation of CO2(g) stops. If 27 mL of 6.0 M H2SO4 was spilled, what is the minimum mass of NaHCO3 that must be added to the spill to neutralize the acid? If 3.45 mL of vinegar needs 42.5 mL of 0.115 M NaOH to reach the equivalence point in a titration, how many grams of acetic acid are in a 1.00-qt sample of this vinegar? 4.85 A 4.36-g sample of an unknown alkali metal hydroxide is dissolved in 100.0 mL of water. An acid–base indicator is added and the resulting solution is titrated with 2.50 M HCl(aq) solution. The indicator changes color signaling that the equivalence point has been reached after 17.0 mL of the hydrochloric acid solution has been added. (a) What is the molar mass of the metal hydroxide? (b) What is the identity of the alkali metal cation: Li+, Na+, K+, Rb+, or Cs+? 4.86 An 8.65-g sample of an unknown group 2A metal hydroxide is dissolved in 85.0 mL of water. An acid–base indicator is added and the resulting solution is titrated with 2.50 M HCl(aq) solution. The indicator changes color signaling that the equivalence point has been reached after 56.9 mL of the hydrochloric acid solution has been added. (a) What is the molar mass of the metal hydroxide? (b) What is the identity of the metal cation: Ca2+, Sr2+, Ba2+? 4.87 A solution of 100.0 mL of 0.200 M KOH is mixed with a solution of 200.0 mL of 0.150 M NiSO4. (a) Write the balanced chemical equation for the reaction that occurs. (b) What precipitate forms? (c) What is the limiting reactant? (d) How many grams of this precipitate form? (e)What is the concentration of each ion that remains in solution? 4.88 A solution is made by mixing 15.0 g of Sr(OH)2 and 55.0 mL of 0.200 M HNO3. (a) Write a balanced equation for the reaction that occurs between the solutes. (b) Calculate the concentration of each ion remaining in solution. (c) Is the resultant solution acidic or basic? 4.89 A 0.5895-g sample of impure magnesium hydroxide is dissolved in 100.0 mL of 0.2050 M HCl solution. The excess acid then needs 19.85 mL of 0.1020 M NaOH for neutralization. Calculate the percent by mass of magnesium hydroxide in the sample, assuming that it is the only substance reacting with the HCl solution. 4.90 A 1.248-g sample of limestone rock is pulverized and then treated with 30.00 mL of 1.035 M HCl solution. The excess acid then requires 11.56 mL of 1.010 M NaOH for neutralization. Calculate the percent by mass of calcium carbonate in the rock, assuming that it is the only substance reacting with the HCl solution. 4.91 Gold is one of the few metals that can be obtained by panning, where a simple pan is used to separate gold from other deposits found in or near a stream bed. What two properties of gold make it possible to find gold, but not metals like copper, silver, lead, and aluminum, by panning? 4.92 The accompanying photo shows the reaction between a solution of Cd(NO3)2 and one of Na2S. What is the identity of the precipitate? What ions remain in solution? Write the net ionic equation for the reaction. 4.93 Suppose you have a solution that might contain any or all of the following cations: Ni2+, Ag+, Sr2+, and Mn2+. Addition of HCl solution causes a precipitate to form. After filtering off the precipitate, H2SO4 solution is added to the resulting solution and another precipitate forms. This is filtered off, and a solution of NaOH is added to the resulting solution. No precipitate is observed. Which ions are present in each of the precipitates? Which of the four ions listed above must be absent from the original solution? (a) Write a net ionic equation for the reaction that occurs in each of the experiments. (b) Identify the precipitate formed, if any, in each of the experiments. 4.95 Antacids are often used to relieve pain and promote healing in the treatment of mild ulcers. Write balanced net ionic equations for the reactions between the HCl(aq) in the stomach and each of the following substances used in various antacids: (a) Al(OH)3(s), (b) Mg(OH)2(s), (c)MgCO3(s), (d) NaAl(CO3)(OH)2(s), (e) CaCO3(s). (a) Which of these reactions are redox reactions? (b) In each redox reaction identify the element undergoing oxidation and the element undergoing reduction. 4.97 Consider the following reagents: zinc, copper, mercury (density 13.6 g/mL), silver nitrate solution, nitric acid solution. (a) Given a 500-mL Erlenmeyer flask and a balloon can you combine two or more of the foregoing reagents to initiate a chemical reaction that will inflate the balloon? Write a balanced chemical equation to represent this process. What is the identity of the substance that inflates the balloon? (b) What is the theoretical yield of the substance that fills the balloon? (c) Can you combine two or more of the foregoing reagents to initiate a chemical reaction that will produce metallic silver? Write a balanced chemical equation to represent this process. What ions are left behind in solution? (d) What is the theoretical yield of silver? [4.98] Lanthanum metal forms cations with a charge of 3+. Consider the following observations about the chemistry of lanthanum: When lanthanum metal is exposed to air, a white solid (compound A) is formed that contains lanthanum and one other element. When lanthanum metal is added to water, gas bubbles are observed and a different white solid (compound B) is formed. Both A and B dissolve in hydrochloric acid to give a clear solution. When either of these solutions is evaporated, a soluble white solid (compound C) remains. If compound C is dissolved in water and sulfuric acid is added, a white precipitate (compound D) forms. (a) Propose identities for the substances A, B, C, and D. (b) Write net ionic equations for all the reactions described. (c) Based on the preceding observations, what can be said about the position of lanthanum in the activity series (Table 4.5)? 4.99 A 35.0-mL sample of 1.00 M KBr and a 60.0-mL sample of 0.600 M KBr are mixed. The solution is then heated to evaporate water until the total volume is 50.0 mL. What is the molarity of the KBr in the final solution? 4.100 Using modern analytical techniques, it is possible to detect sodium ions in concentrations as low as 50 pg/mL. What is this detection limit expressed in (a) molarity of Na+, (b) Na+ ions per cubic centimeter? 4.101 Hard water contains Ca2+, Mg2+, and Fe2+, which interfere with the action of soap and leave an insoluble coating on the insides of containers and pipes when heated. Water softeners replace these ions with Na+. (a) If 1500 L of hard water contains 0.020 M Ca2+ and 0.0040 MMg2+, how many moles of Na+ are needed to replace these ions? (b) If the sodium is added to the water softener in the form of NaCl, how many grams of sodium chloride are needed? 4.102 Tartaric acid, H2C4H4O6, has two acidic hydrogens. The acid is often present in wines and precipitates from solution as the wine ages. A solution containing an unknown concentration of the acid is titrated with NaOH. It requires 24.65 mL of 0.2500 M NaOH solution to titrate both acidic protons in 50.00 mL of the tartaric acid solution. Write a balanced net ionic equation for the neutralization reaction, and calculate the molarity of the tartaric acid solution. 4.103 (a) A strontium hydroxide solution is prepared by dissolving 10.45 g of Sr(OH)2 in water to make 50.00 mL of solution. What is the molarity of this solution? (b) Next the strontium hydroxide solution prepared in part (a) is used to titrate a nitric acid solution of unknown concentration. Write a balanced chemical equation to represent the reaction between strontium hydroxide and nitric acid solutions. (c) If 23.9 mL of the strontium hydroxide solution was needed to neutralize a 31.5 mL aliquot of the nitric acid solution, what is the concentration (molarity) of the acid? [4.104] A solid sample of Zn(OH)2 is added to 0.350 L of 0.500 M aqueous HBr. The solution that remains is still acidic. It is then titrated with 0.500 M NaOH solution, and it takes 88.5 mL of the NaOH solution to reach the equivalence point. What mass of Zn(OH)2 was added to the HBr solution? 4.105 Suppose you have 5.00 g of powdered magnesium metal, 1.00 L of 2.00 M potassium nitrate solution, and 1.00 L of 2.00 M silver nitrate solution. (a) Which one of the solutions will react with the magnesium powder? (b) What is the net ionic equation that describes this reaction? (c) What volume of solution is needed to completely react with the magnesium? (d) What is the molarity of the Mg2+ ions in the resulting solution? 4.106 (a) By titration, 15.0 mL of 0.1008 M sodium hydroxide is needed to neutralize a 0.2053-g sample of an organic acid. What is the molar mass of the acid if it is monoprotic? (b) An elemental analysis of the acid indicates that it is composed of 5.89% H, 70.6% C, and 23.5% O by mass. What is its molecular formula? 4.107 A 3.455-g sample of a mixture was analyzed for barium ion by adding a small excess of sulfuric acid to an aqueous solution of the sample. The resultant reaction produced a precipitate of barium sulfate, which was collected by filtration, washed, dried, and weighed. If 0.2815 g of barium sulfate was obtained, what was the mass percentage of barium in the sample? 4.108 A tanker truck carrying 5.0 × 103 kg of concentrated sulfuric acid solution tips over and spills its load. If the sulfuric acid is 95.0% H2SO4 by mass and has a density of 1.84 g/mL, how many kilograms of sodium carbonate must be added to neutralize the acid? 4.109 A sample of 5.53 g of Mg(OH)2 is added to 25.0 mL of 0.200 M HNO3. (a) Write the chemical equation for the reaction that occurs. (b) Which is the limiting reactant in the reaction? (c) How many moles of Mg(OH)2, HNO3, and Mg(NO3)2 are present after the reaction is complete? 4.110 A sample of 1.50 g of lead(II) nitrate is mixed with 125 mL of 0.100 M sodium sulfate solution. (a) Write the chemical equation for the reaction that occurs. (b) Which is the limiting reactant in the reaction? (c) What are the concentrations of all ions that remain in solution after the reaction is complete? [4.111] The average concentration of bromide ion in seawater is 65 mg of bromide ion per kg of seawater. What is the molarity of the bromide ion if the density of the seawater is 1.025 g/mL? [4.112] The mass percentage of chloride ion in a 25.00-mL sample of seawater was determined by titrating the sample with silver nitrate, precipitating silver chloride. It took 42.58 mL of 0.2997 M silver nitrate solution to reach the equivalence point in the titration. What is the mass percentage of chloride ion in the seawater if its density is 1.025 g/mL? 4.113 The arsenic in a 1.22-g sample of a pesticide was converted to AsO43− by suitable chemical treatment. It was then titrated using Ag+ to form Ag3AsO4 as a precipitate. (a) What is the oxidation state of As in AsO43−? (b) Name Ag3AsO4 by analogy to the corresponding compound containing phosphorus in place of arsenic. (c) If it took 25.0 mL of 0.102 M Ag+ to reach the equivalence point in this titration, what is the mass percentage of arsenic in the pesticide? After drawing air through the acid solution for 10.0 min at a rate of 10.0 L/min, the acid was titrated. The remaining acid needed 13.1 mL of 0.0588 M NaOH to reach the equivalence point. (a) How many grams of NH3 were drawn into the acid solution? (b) How many ppm of NH3were in the air? (Air has a density of 1.20 g/L and an average molar mass of 29.0 g/mol under the conditions of the experiment.) (c) Is this manufacturer in compliance with regulations?